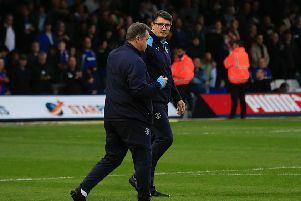 Luton are going to have to cope with being the prize scalp for the rest of League One if they are going to win promotion to the Championship this season, according to boss Mick Harford. With 11 matches to go, the Hatters are top of the League One by five points from nearest rivals Barnsley, but must now expect opposition teams to double their efforts in trying to shoot them off their perch. Ahead of tomorrow's trip to Plymouth Argyle, who are sitting in 14th place, Harford said: “It’s something we are aware of, you are top of the table and people do want to beat you. "People want to win every game, it’s not just because you’re top of the table, but it’s a good scalp for someone who beats the team that’s top. "So we’ll make our players aware of what they’re about, what their strengths are, what their weaknesses are and hopefully we can counteract everything they throw at us." The Luton chief thinks his side have already experienced just how opposition teams will approach the upcoming fixtures, after drawing with Coventry and beating Rochdale in their last two matches. He continued: "I think you’ve seen over the last few home games, it’s been a bit of a struggle, a bit of a tussle. "Teams have come and made it very, very hard for us. "They get bodies behind the ball, make it difficult for us, we’re not as fluent as we have been in certain games, but you see a different side to the players. "The way they grind things out, the way they work things out and they just keep going. "They were so patient the other day, they just get that way we wanted to play and basically ground them down. Last weekend’s opponents Rochdale certainly proved Harford's theory, with keeper Andy Lonergan booked in the first half for time-wasting over a free kick. The Town boss said: “It was just frustrating early on in terms of the way they set up. “They’re in a false position in my opinion, the way they play, the way they create chances and the way they move the ball around. "First half I think they looked solid, there were a few incidents when they were slowing the play down and taking the sting out of the game, which is totally understandable. "We understand, we know that happens, they took it to the limits a couple of times, but we’ve told the players, we know ourselves, the supporters know it, everyone knows it. "Teams are not going to come here and roll over, they’re playing the team that’s top of the league and they want to beat the top of the league team. "It’s difficult, teams come, they change shape and it’s testament in my opinion, to the way the players go about their work on a daily basis. "I keep saying it, they seem to get over certain things that are put in front of them. "Maybe he was told to do so I don’t know, but he was excellent for them. “He did excellent for the first two saves before the goal and he nearly got the goal to be honest. "He’s got great experience, had a great career, and he used all his experience, time-wasting, his kicking was good. "You’ve got to expect that when a team’s struggling like Rochdale are, to come to Luton and do that because I think it’s a tactic most people are going to use."